At first the surgeon was extracting 7/8cc twice a week, but this week he has increased the extraction to 12cc. Edie is now strong enough that she no longer has to go to the hospital for the procedure and it can be done in the clinic. When we first found the cyst we put Edie on a course of steroids to help bring the swelling down, she is completely off steroids now but still has a little puffiness around the face. 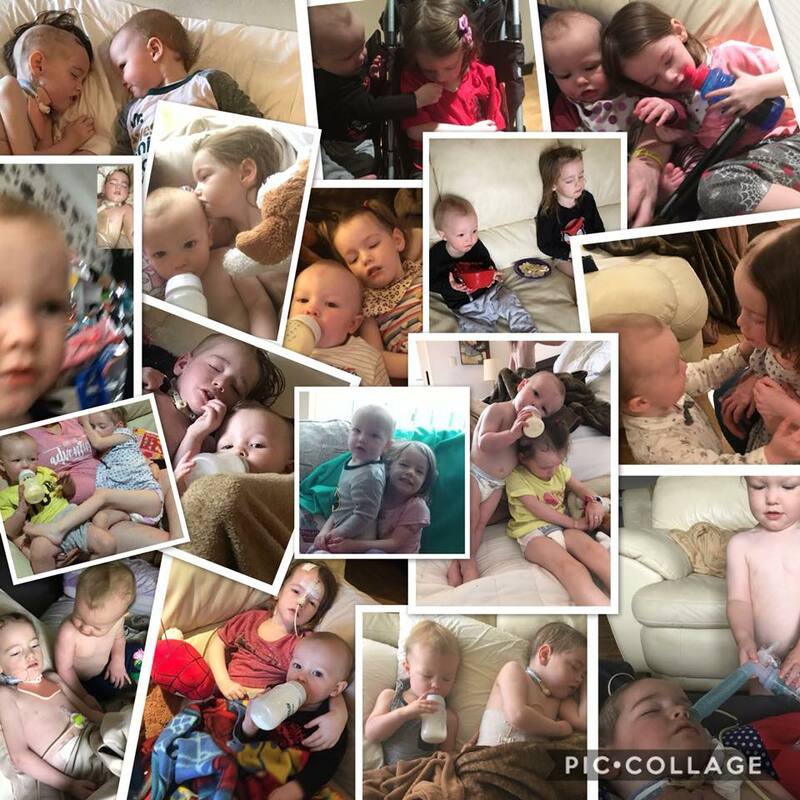 IronLen, Edie’s little brother had only just turned one when his big sister was diagnosed last November. My beautiful little girl, 3 years old, lights up any room just by walking into it. She’s funny, loving, caring and just absolutely adorable! We’ve just found out that she has inoperable brain cancer! Why? Just why?? How is that fair?? This cancer, up to now, has been a death sentence and any treatment only makes it come back quicker and more aggressive. I’d give anything to take it away from her, sadly nowhere in the UK or Europe can, her best chance of survival lies in Mexico and the pioneering treatments they’re doing there. 2 children in as many months have now been classed as NED or No Evidence of Disease! This has to be a good enough reason to get there?! We are trying to raise as much as we possibly can, as quickly as we can. Anything you can give or do to help, however small the effort or donation could make all the difference. A massive thank you to all who can help us!! Our crowd funding page is officially live! Please donate as much or as little as you can to help us get our baby girl to Mexico! 30th November 2017 – Steve and I had the most heartbreaking news we could ever imagine. After months of headaches my three year old daughter Edie was referred for an MRI with suspect migraines. The result of these scans came back that Edie has a 3.4cm tumour in her brain stem. We then went straight to Alder Hey hospital in Liverpool, where she had a more advanced MRI scan on the Friday. She still has to go through more tests but the specialists believe it could be a Diffuse Intrinsic Pontine Glioma (DIPG). This is a rare cancer that effects children and so far is untreatable, incurable and fatal. 5th December 2017 – We returned to Alder Hey and Edie got to meet Dr Ranj filming for CBeebies. We spoke to a number of specialists and were left with a lot to think over. After meeting Lucy from Lucy’s Pineapple Fund, we also contacted the Instituto de Oncologia Intervencionista in Monterrey, Mexico, a group of doctors specialising in DIPG treatment who asked for a copy of Edie’s brain scans and a video of her in person.